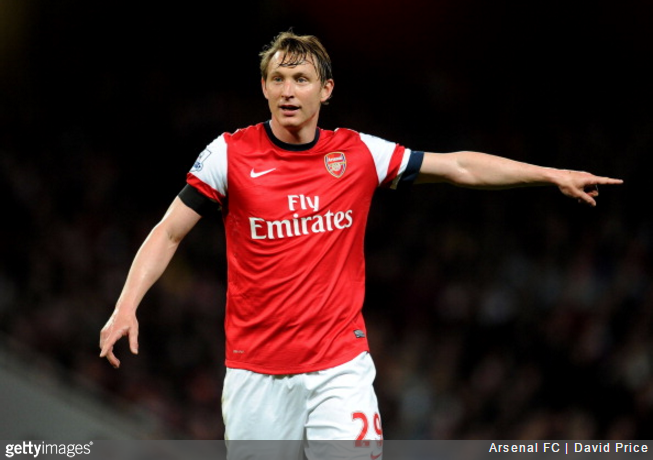 In the grand scheme of things, Kim Kallstrom’s ever-so-brief stint as an Arsenal player in 2014 is fairly unlikely to go down as anything more than a blip of a footnote in the club’s grand history. The Swedish midfielder signed on loan from Spartak Moscow in the final few hours of transfer deadline day of January, 2014. The fact that he arrived nursing a fairly serious back injury didn’t help as he went on to make just four appearances for the Gunners before being released back into the wild at the end of the season. Despite the brevity of the experience, Kallstrom remembers his time at the Emirates incredibly fondly, as revealed during a radio essay he delivered in his native Sweden recently. As transcribed and posted on Arsenal Reddit by someone or something called Zhongda, the midfielder’s account of his fleeting dalliance with life in North London really is lovely. I look like a boy as I walk across the grass, with the ball under my arm. Well-groomed side-parting, a clean red shirt, white sleeves, and a golden cannon on my breast. I’m a man past thirty years of age, in a boy’s dream. It’s the semi-final of the English FA cup, against Wigan, with 82,000 people on the stands of Wembley Stadium, among which 50,000 were rooting for us (Arsenal). They are loud and starving fans that hunger for a title. They haven’t won anything for nine years, which is an eternity for a club that is considered one of the greatest in the World. They have the most loyal fans, Gooners. By strange and unexpected detours, I’ve ended up at the top club Arsenal, in north London. With straight legs, I bend down and put the ball on the spot. I throw a quick glance at the keeper. I’ve already decided where to place it. I try not to smile. The moment is here. I’m here – in the middle of the latin motto of the club: “Victoria Concordia Crescit” – “Victory grows through harmony”. I can’t help myself but smile slightly. I haven’t even played half an hour for Arsenal. I debuted against Swansea, for eleven minutes, and now I was substituted on in extra time when it was to be decided. Fifteen minutes of a footballer’s life, which changed my story. It was transfer deadline day and a rumour of a new player had leaked. The training facilities were filled with supporters, journalists and television was transmitting live. When we arrived at Heathrow, we had to drive to a field and switch cars so that no one would recognise the vehicle. Everyone was nice to me, and I get training clothes and number 29. I was sent to a team physician for the obligatory medical exam. While the physician is going through the tests, I’m sitting in the cafeteria, drinking a cup of washy English coffee. I’m dressed in the club colours, in the civilian outfit of the professional football player, meaning a t-shirt, shorts and flip-flops. Players pass by on the way to today’s training. I knew a few of them, as they were French, and we small-talk a bit. The physician fetches me, and I’m driven quickly to a hospital for a X-ray exam. Something’s wrong. We return to the training facilities. I’m put in a situation that reminds me of a talent show on television. I’m standing in front of a jury, in Arsenal clothes, the CD with my X-ray images, and my bad posture. In front of me sits the team physician, the sporting director, and the powerful manager Arsene Wenger, who has run the club with an iron fist and a low-key attitude for almost 20 years. The physician starts speaking. He understands that Arsenal is a big thing for me and that my hopes have been lit, but the back problem is too bad, and he’s sorry. He lays down the facts. There are three cases of vertebral fractures, and I’m out for at least 4-6 weeks. I’m shocked – disappointed, but I understood. Against the evidence of the X-ray images, neither boyhood dreams or arguments help. I understand. ‘If you’re injured, you’re injured’, I say, but in truth I was angry as hell. There’s silence in the room. Wenger hasn’t said anything. He hasn’t even looked at his colleagues as they inform me of their logical verdicts. Surprised, the others turn to the big boss. No one knows how he’ll continue, but they know that his words are law. It’s evident that he has not anchored his decision among the rest of the staff. Now, the next circus starts. I could follow the events in real time, as the media started writing and friends contacted me. In spite of a time difference of four hours, and the Russian football association being closed, the transfer was done. The contract was signed in the last hour. I had left Spartak Moscow when everyone was asleep; I was just gone the next morning. I got a few good luck texts, but other than that, Russia was over for the time being. I train like a mad man in England. I’m good at that. One day at the gym, Wenger stops by. When he enters a room, everybody sort of stops, as if they’re waiting for a signal. He has that effect on people. I keep peddling on the exercise bike, as I’m trying to beat a certain time. Wenger is watching with his French, slightly casual, yet serious, gaze. We small-talk and we’re on the right track. I felt like I was building confidence with the leader, without having kicked a ball yet. After five weeks of hard rehab, and the uncertainty whether my back would be restored, I’m suddenly back on the pitch. It was a long time since the club had won anything, and the British capital is boiling with the tabloids acting as ring-leaders. We’re favourites against Wigan in the semi-finals, but we only manage to achieve a draw at full-time. The clock ticks, without anyone ending it. I’m sitting on the bench without any personal expectation. There’s seven minutes left and I’m suddenly substituted for an exhausted Aaron Ramsey. The ref blows the whistle. Now, one of the finalists must be decided by a penalty shootout. A simple and brutal way to end things. At this point, understanding of the game, tactics, and physical prowess are meaningless. Now, there is only a confused mess of nerves and chance. Penalty shoot-outs can crown kings in football, and always produce a scapegoat. You must score. All the pressure is on the taker. I decide early where to shoot it. When I walk alone to the spot, in a stadium with three times as many spectators as there are inhabitants of my hometown, Sandviken, I must suppress my smile. It’s a long way to walk across the pitch. I’m relaxed – perhaps happy. I put the ball on the spot. Now, I just have to back up and find the right distance to the ball, run up, and strike the ball hard and high to the left. Just do what I usually do, what I know, and always have done. I’ve done it a thousand times before, and there’s no nervousness. The keeper goes early, in the opposite direction of where I had decided to put it. When I watch the penalty on Youtube, the feelings return: the calm and the joy, but I’m surprised where the ball ended up. The ball ended up in the lower left corner, opposite of how I remembered it. I had decided to put it high to the left, but I remembered it as I actually put it low to the right. I’m confused, but the ball ended up in the net. We won the final and we’re praised by over 200,000 supporters on the streets of London. Although my contribution was small in the 120-year history of the club, it was a highlight for me. The greatest fifteen minutes of my life, and it turns out I don’t remember what happened. Where was I in that deciding moment? Trance, shock, delirium, coma, nervous breakdown, call it whatever you want. The only thing I know for sure is that sports and football are incomprehensible. That’s why we love it. As long as that penalty continues to end up in the net, my experience is true. I’m sure of it. Wow. Such eloquence. Love it.